New Delhi/Amritsar, April 13: Prime Minister Narendra Modi and Congress President Rahul Gandhi on Saturday paid homage to hundreds of people, who were massacred by British forces at Jallianwala Bagh in Amritsar on April 13, 1919. In a tweet, PM Modi said valour and sacrifice of martyrs will never be forgotten. The Year 2019 marks the centenary of the Jallianwala Bagh massacre. "Today, when we observe 100 years of the horrific Jallianwala Bagh massacre, India pays tributes to all those martyred on that fateful day. Their valour and sacrifice will never be forgotten. Their memory inspires us to work even harder to build an India they would be proud of," PM Modi tweeted. Congress chief Rahul Gandhi visited the Jallianwala Bagh Memorial in Amritsar to pay tributes to those who lost their lives. UK PM Theresa May Expresses Regret Over Jallianwala Bagh Massacre. 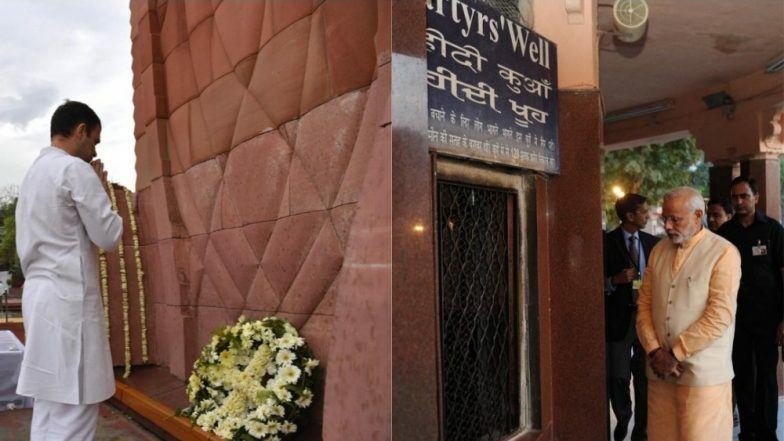 Accompanied by Punjab Chief Minister Captain Amarinder Singh and state minister Navjot Singh Sidhu, Rahul Gandhi paid floral tributes at the Jallianwala Bagh Memorial. "The cost of freedom must never ever be forgotten. We salute the people of India who gave everything they had for it. Jai Hind," Gandhi wrote in the visitors' book at the memorial. On Friday, he prayed at the Akal Takht, Golden temple. The Jallianwala Bagh massacre is one of the darkest chapters of India's freedom struggle against the British occupation. On this day, soldiers of the British Indian Army, on the orders of Colonel Reginald Dyer, massacred peaceful and unarmed celebrators, including women and children, on the occasion of the Baisakhi. The British government, even after 100 years, has only regretted the massacre but stopped short of apologising for the killing of so many innocent people. UK Prime Minister Theresa May on Wednesday expressed regret over the worst bloodbath committed by the British Army during the colonial period, terming it as a "shameful scar" on British Indian history.